Peter Counter, FindBiometrics … Mobile World Congress 2019 is a hub of biometrics and mobile authentication news this week, and adding to the strong authentication buzz is the announcement of three new smartphone integrations of Sensory’s TrulySecure authentication software. Three new Nokia smartphones, announced by HMD Global at MWC, leverage Sensory’s biometric technology to enable robust face-unlock features…..
Stipe, NokiaMob.net … Sensory, a company operating in the field of speech and vision Technologies, announced in an official press release that the latest Nokia Devices, the Nokia 3.2, Nokia 4.2 and Nokia 9 PureView come with their TrulySecure facial recognition technology. The company claims that the system identifies users in less than a second and can differentiate individuals at a 99.999% accuracy rate. All data the system gathers is encrypted and stored on the device…. Idrees Patel, xdadevelopers… Software-based face unlock has become an increasingly popular feature in Android smartphones over the last year. OnePlus, Xiaomi, Huawei, OPPO, Vivo, LG, and others all have their own version of software-based face unlock. It’s important to note that software-based face unlock is fundamentally different from 3D facial recognition… Sensory is the company behind TrulySecure, an on-device facial recognition system that is already found in smartphones from a few brands. The company deals with speech and vision technologies. It has now integrated TrulySecure facial recognition into the Nokia 9 PureView, Nokia 4.2, and Nokia 3.2…. Clayton Moore, Digital Trends… We’re all getting pretty used to summoning our various devices via voice by now, be it through Amazon’s Alexa, Apple’s Siri, or Google Assistant. Now, a new company is getting into the smart home ecosystem. Universal Electronics, Inc. (UEI) is pairing its digital assistant platform for the smart home, code-named Nevo Butler, with TrulyHandsfree voice command capabilities, including customer-branded wake words from speech-recognition firm Sensory.……. PYMNTS.com … In 1994 the fastest imaginable connection to the internet was a 28.9 kbps dial-up modem and email was still mostly a new thing that many people were writing off as a fad. There was no such thing as Amazon.com for the first half the year and less than a third of American households owned computers. Given that, it’s not much of a surprise that the number of people thinking about voice-activated, artificial intelligence (AI)-enhanced wireless technology was extremely small — roughly the same as the number of people putting serious thought into flying cars. But the team at Sensory is not quite as surprised by the rapid onset evolution of the voice-activated technology marketplace as everyone else may be — because when they were first opening their doors 25 years ago in 1994, this is exactly the world they had hoped to see developing two-and-a-half decades down the line, even if the progress has been a bit uneven……. Mathew Dirjish, Sensors … Sensory, developer of wake words for personal assistants, says it has made significant upgrades to the embedded artificial intelligence (AI) in its sixth generation of TrulyHandsfree, boosting the technology’s wake word performance and accuracy by more than 65%. Additionally, the company has improved the application’s deep-neural network training that allows for better near- and far-field speech recognition performance in all room conditions. …..
Laura Dolan, Embedded Computing … Sensory announced that it has made major improvements to its sixth generation of TrulyHandsfree, increasing wake word performance and accuracy by more than 65 percent. TrulyHandsfree’s improved deep-neural network training will provide better near- and far-field speech recognition performance in a variety of room conditions. …..
Alex Perala, Mobile ID World, … Sensory, Inc. has upgraded the wake word technology of its TrulyHandsfree platform to better ensure that a device won’t be activated by a so-called ‘false fire’ – that is, it won’t mistake a different word for its wake word and activate….. Speech Technology Magazine, … Sensory, a provider of wake words for personal assistants, raises the performance bar for always-listening wake word and speech recognition, with an upgraded turn-key voice interface solutions for devices of all shapes, sizes, and power requirements…. Speech Technology Magazine, … One of the best parts of putting together the Speech Industry Awards is watching the patterns and trends that emerge—it has a way of distilling what we already knew… … 2018 Star Performers – These cutting-edge vendors are leading the way in AI, analytics, natural language, smart speakers, and more…..
Eileen Brown, ZDNet, … At last, there is a breakthrough in AI technology that could change how we will interact with our favorite mobile apps……. Richard Harris, App Developer Magazine ADM, … Sensory has announced their low-power TrulyHandsfree wake word and speech recognition AI engine on Android and iOS smartphone applications to provide AI on a smartphone without all of the battery drain……. Peter Counter, MobileIDWorld, … Sensory, Inc. has announced a major innovation in hands-free technology: its TrulyHandsfree solution can now enable low-power wake words directly on any Android or iOS app without the need for special hardware or digital signal processors. That means mobile apps can now have always-listening speech activation, just like the virtual assistants that popularized the function, without draining your smartphone’s battery. …..
Ian Barker, Betanews, … We’ve become increasingly used to technology that uses ‘wake words’ like, “Hey, Cortana” to initiate interaction. But this technology has, so far, failed to make a big impact in the mobile apps arena, the main reason being the battery drain created by having an app that’s constantly listening. That could be about to change as Silicon Valley company Sensory is announcing a breakthrough in running its TrulyHandsfree wake word and speech recognition AI engine directly on Android and iOS smartphone applications at low-power. …..
AIThority… TrulySecure, Sensory’s Class-Leading Facial Recognition Solution Found In Top-Selling Smartphones And Banking Apps, Now Utilizes Depth Information Provided By 3D Cameras……. PYMNTS… The potential for commerce applications to be embedded in a car’s dashboard is great. Who hasn’t fantasized about owning a car that can be told to pay for its own gas at the pump or buy the driver a cuppa job at the drive-thru without having to tap, swipe or really even touch anything? Unfortunately, the gap between that potential and the real-world experience is also great, as voice-activation expert and Sensory CEO Todd Mozer told Karen Webster in a recent conversation……..
PYMNTS…Sensory is a brand whose name may not be immediately recognizable, but whose tech surely is. “There are any number of devices that, for example, if you’ve said, ‘Hello Alexa,’ you’re actually talking to Sensory technology,” Sensory’s chairman and CEO, Todd Mozer, told Karen Webster in a recent conversation, noting that Sensory’s close collaboration with Amazon “on a variety of projects” is also public knowledge……. Alex Hernandez, TechAeris…If you’ve never used Waze before you should really give it a try. It’s by far one of the best navigation apps for mobile phones. Waze isn’t just any old navigation app, it’s a community of users helping each other….. Thanks to Sensory’s TrulyHandsfree technology, the entire navigation experience from entering a destination address, to sending a report of a pothole or accident, can be done hands-free simply by starting with the command “OK Waze!”……..
Paul Sawers, Venturebeat…Waze is getting a handful of new features today as the Google-owned navigation app targets two-wheeled motorists and doubles down on its safety credentials.……..
Alex Perala, Mobile ID World…Fujitsu is now bringing Sensory Inc.‘s TrulySecure facial recognition technology to its customers thanks to a new partnership between the companies……..
Antony Peyton, Banking Technology…Fujitsu has teamed with Silicon Valley-based Sensory to provide face biometric authentication for Mizuho’s mobile banking…….. DARK Reading…Sensory’s TrulySecure face recognition technology offers safe and convenient user authentication without ever sending critical biometric data to the cloud……. Doug Lynch, xda…With each passing year, we become increasingly reliant on our smartphones for important tasks. Many of those tasks are of a sensitive nature, which is one reason we’re seeing an influx of biometric technologies on mobile devices in the form of fingerprint scanners, iris scanners, and facial recognition sensors. One company leading the charge is Sensory, which announced on Monday that it’s partnering with Fujitsu to bring its FIDO Certified facial recognition technology to banks, financial institutions, enterprises, and other businesses…….. Innovation Essence…TrulyNatural™ is the first embedded large vocabulary continuous speech recognizer system which can provide the same state-of-the-art performance as cloud based technologies, but on the device. Many applications don’t need, or don’t want to rely on, a cloud based connection to do high performance speech recognition. Connections can frequently fail or cause fatal delays, and recent concerns have been expressed about sending personal data to the clouds where it could be stolen or used for purposes undesirable to the owner……. Nicole DiGiose, Electronic Products Magazine…Sensory brings chatbot and avatar technology to consumer devices and apps. Developers have a new kind of voice interface option for their consumer products and apps, one that can also put on a face. Speech and vision technology company, Sensory, just announced a chatbot feature for its speech recognition platform, TrulyNatural. Simply put, the system supports animation of a face for an AI assistant, with movement synchronized to its speech, and it functions entirely on-device with no need for a live internet connection……..
Find Biometrics …Sensory, Inc. has introduced a chatbot feature to its TrulyNatural embedded speech engine, the company has announced. TrulyNatural is the company’s natural speech recognition platform, designed to let users communicate with devices by speech without being required to use predetermined phrases. Now, the system has been equipped with chatbot support allowing for “dialog management and scripting,” according to a statement from Sensory; and what’s more, it also leverages a patented technology designed to dynamically shape a digital avatar’s mouth movements so that they reflect the words being spoken. In other words, the system now supports a live animated AI assistant – and it functions entirely on-device, with no need for a live internet connection……. Speech Technology Magazine …Sensory’s latest additions to TrulyNatural speech recognition bring chatbot and avatar technology to consumer devices and apps……. Alex Perala, Mobile ID World…Sensory, Inc. has introduced a chatbot feature to its TrulyNatural embedded speech engine, the company has announced. TrulyNatural is the company’s natural speech recognition platform, designed to let users communicate with devices by speech without being required to use predetermined phrases……. Find Biometrics…“Sensory says TrulyHandsfree is the most widely deployed speech recognition system in the world and is now featured on over two billion devices.” Sensory Inc. has upgraded the AI of its TrulyHandsfree voice activation technology…..
Mojtaba Arvin, Artificial Intelligence Online…“Sensory says TrulyHandsfree is the most widely deployed speech recognition system in the world and is now featured on over two billion devices.” Sensory Inc. has upgraded the AI of its TrulyHandsfree voice activation technology…..
Tim, Quicklogic Blog… The dream of having a truly “smart” home has finally started to materialize in a meaningful way. One aspect of the smart home concept which has been severely underestimated until very recently, though, is the emergence of voice-activated systems and their ability to make sense of spoken commands and requests from humans… ………..
Eileen Brown , zdnet.com… No more fiddling with your headset whilst out on a run. VoiceGenie brings you hands free control of your device and Amazon Alexa Voice Services in the cloud. Speech and vision provider Sensory Inc. has brought its speech recognition technology to Bluetooth headphones and headsets. The VoiceGenie solution gives hands-free voice control of functions, music playback, call handling, and control of smartphone assistants such as Siri or Cortana. Mike Elgan, Computerworld … At CES, we’re learning that virtual assistants like Amazon’s Alexa will be delivered as a utility to almost every appliance in your home. ….Amazon’s virtual assistant, which first appeared more than two years ago on Amazon’s Echo smart speaker, seemed to be popping up everywhere at the annual International CES trade show in Las Vegas this week…. We also learned this week that Alexa support is being extended to the… Sensory VoiceGenie……. Jason Bouwmeester, Techaeris… It seems that one of the underlying themes at CES 2017 is the integration of Alexa Voice Services into third-party products. Sensory is bringing voice activated Alexa to Bluetooth headsets with their VoiceGenie suite of technologies and application. Through VoiceGenie, the Alexa integration will enable a hands-free voice assistant to not only control music but also access other information. ……..
AP, Hindustan Times… Amazon doesn’t have an official presence at the CES gadget show in Las Vegas but its Alexa voice control software seems to be everywhere. …Other gadgets that include Alexa: Sensory and OnVocal are both launching headphones that incorporate Alexa. Simplehuman is announcing a voice-activated trash can. And GE Lighting is launching a table lamp that includes Alexa software……. Staff, Phys.org… Amazon doesn’t have an official presence at the CES gadget show in Las Vegas but its Alexa voice control software seems to be everywhere…. Other gadgets that include Alexa: Sensory and OnVocal are both launching headphones that incorporate Alexa…..
Michael Sawh, Wareable… Alexa, Amazon’s digital assistant looks set to be an even bigger deal in 2017 and that’s because it’s jumping out of the Echo speaker and into other tech, including hearables. David Priest, CNet… New tech from hardware developer Sensory will soon give your Bluetooth headphones always-listening capabilities. ……..
Dominik Bosnjak, Android Headlines… Earlier today, a Californian tech company Sensory introduced VoiceGenie, a solution for allowing wireless headphones to communicate with Amazon’s Alexa AI assistant. VoiceGenie connects to smart devices via Bluetooth and supports voice commands, meaning users can simply tell their headphones or earbuds to play a song, make a call, shuffle a playlist, or rewind a track. ……..
Graham Prophet, EDN europe… XMOS (Bristol, UK) and Sensory (Santa Clara) have formed a partnership to deliver Sensory’s TrulyHandsfree voice control technology on the XMOS xCORE-VOICE far-field voice capture processing platform, combining embedded speech capture with voice control technologies. ……..
“Enabled by Sensory’s TrulyHandsfree technology, the [voice command] feature lets users control the headset by voice command, allowing them to make calls or check the battery status without actually having to manipulate the headset itself.”……. Business Wire… The VoiceIQ smart microphone uses an audio processing algorithm with acoustic activity detection licensed from Sensory, Inc. This algorithm is embedded directly into a SiSonic MEMS microphone from Knowles…………..
Doug Lynch, xda… If you’re a developer with a product that has a microphone and a speaker, then you can integrate the Amazon Voice Service (AVS) API into your device… To help out, Amazon has even released a prototype project that can be built for the Raspberry Pi. To make this project happen, Amazon got together with Sensory and KITT.AI so they could leverage their 3rd-party wake word engines…………. Eric Carter, ProgrammableWeb… Amazon has announced an Alexa Voice Service (AVS) API update that allows developers to build voice-activated products… To assist users with building with AVS, Amazon has released a Raspberry Pi prototyping project. Amazon partnered with Sensory and KITT.AI for the project to leverage their third party wake word engines………..
BI Intelligence IoT Briefing subscribers, Business Insider… Amazon is partnering with Sensory, a voice-recognition startup, to lay the groundwork for third-party developers to integrate Alexa into their devices, reports CNET………..
Alex Perala, Find Biometrics… Sensory is celebrating a number of industry accolades. The company says it has won “over half a dozen awards” this year, according to a statement………. Madison Moore, SD Times… Sensory has announced that it’s collaborating with the Alexa Voice Services (AVS) team to give developers the ability to use the wakeup word “Alexa.”………. Alex Perala, Find Biometrics… Sensory Inc. has teamed up with the Alexa Voice Service (AVS) team to bring “Alexa” wakeup to devices using its TrulyHandsfree technology. That means users who are familiar with the voice-controlled AI assistant will be able to turn on compatible devices just by saying its name. ………. ConsumerElectronics Net… Working with Amazon, Sensory enables CE manufacturers to accelerate prototyping and development of voice-controlled Alexa-enabled products. ………. Ry Crist, C Net… Sensory, which focuses on voice recognition, teams up with Alexa’s creators to make it easier for third-party developers to create voice-activated devices. ………. Kyle Wiggers, Digital Trends… Sensory, a Santa Clara, California-based software company, doesn’t often find itself in the limelight. It’s typically content to let its solutions speak for themselves. The firm, which has been developing computer-driven voice technologies like speech recognition, speech and music synthesis, and speaker verification since the late ’90s, has its technology embedded in more than a billion devices around the world. ………. Find Biometrics… Sensory Inc. will provide facial and voice recognition technology for Samsung SDS solutions, the companies have announced. ………. Justin Lee, Biometric Update… Samsung SDS, Samsung Group’s IT service provider, has partnered with Sensory Inc. to provide customers with a more secure and convenient approach to mobile banking and enterprise authentication services. ………. Alex Perala, MobileIDWorld… Sensory Inc. will provide facial and voice recognition technology for Samsung SDS solutions, the companies have announced. ………. Michael Haynes, AppDeveloper Magazine… Samsung SDS, Samsung Group’s IT service provider is teaming up with Sensory to offer banks and enterprise customers high-security embedded face and voice biometric recognition technologies. ………. Sam Nimmo, Android Headlines… The latest Samsung devices provide some great security options that offer an ideal balance between protection and convenience, such as authentication via fingerprint or iris scanning. Soon, the company will offer additional methods of authentication: face and voice recognition. While similar features already exist in Android, Samsung’s solution will be developed by Sensory using TrulySecure technology, and will be highly accurate and compliant with FIDO standards. ………. CTIA… Today, the 10th annual CTIA Emerging Technology (E-Tech) Awards winners were announced at CTIA Super Mobility 2016™ , the largest wireless event in America… “CTIA Emerging Technology Award winners represent the best mobile products, apps and services of the year that have the potential to influence and benefit businesses and consumers,” … Sensory’s TrulySecure technology has earned first place in Mobiles Security & Privacy………. Chris Burt, Biometric Update… Sensory has launched a free, easy-to-use app to secure Android devices with voice and facial recognition, the company announced Wednesday. AppLock utilizes impenetrable deep learning biometric fusion technology and liveness detection, and the company says it provides twice the security of the best fingerprint and iris sensors with near instant user verification when unlocking apps.…………………. Alex Perala, Mobile ID World… Sensory Inc. has launched an upgraded version of its Android app that adds a powerful layer of security to app protection. Called AppLock, the system uses facial and voice recognition technology to lock apps as designated by the user.…………………. Brandy Shaul, Adweek – Social Times… Sensory announced the full release of its facial- and voice-recognition application on Android. The app allows users to lock access to specific apps and open them by using face and/or voice recognition.…………………. Boyan Josic, Josic… A new mobile security app is being released today which employs biometric fusion technology. AppLock combines face and voice verification which offers twice the security of fingerprint scanners for safeguarding apps on your mobile device.…………………. Stephen Mayhew, Biometric Update… Sensory Inc. announced this past week that Samsung continues to utilize TrulyHandsfree technology to provide speech trigger and speech recognition experience on the Samsung Galaxy S7 and Galaxy S7 Edge smartphones, even when no internet connection is present. …………………. FindBiometrics.com, Samsung has licensed Sensory Inc.’s TrulyHandsfree technology for its Galaxy S7 and S7 Edge smartphones. The integration brings embedded speech recognition to the flagship devices. …………………. Nate Swanner, The Next Web… Intel is adding speech recognition features to its system-on-chips (SoC) via a partnership with Sensory…………………..
Chris Mills, Gizmodo… Always-on digital assistants like “Hey Siri” and “OK Google” add an important layer of simplicity, but thus far they’ve not made it to laptops, mostly due to battery reasons. A new Intel partnership with Sensory is hoping to solve that. …………………..
Cammy Harbison, iDigitalTimes… Three weeks ago, rumors emerged that Apple could bring Siri to the desktop in the next OS X and now it looks like that rumor will be realized. On Tuesday, Intel announced a new partnership with Sensory to develop speech recognition features for its system-on-chips (SoC)…………………..
JC Torres, SlashGear… With Sensory’s TrulyHandsfree speech recognition, any Intel current and future Intel system-on-chip could, in theory, have always-on speech recognition……………………. Pedro Moya, Omicrono… Intel quiere llevar los asistentes de voz a los ordenadores, permitiendo que estén siempre escuchando a la espera de nuestras órdenes…………………. Leonard Klie, Speech Tech Mag… Sensory, a provider of embedded voice and vision technologies, today announced the broad availability of its TrulyHandsfree technology as deeply embedded ports on many of Intel’s latest software-on-a-chip (SoC) platforms targeting the PC, tablet, and smartphone industries…………………. FindBiometrics… Biometrics company Sensory, Inc. is helping track employee attendance in Peru, Chile and Colombia thanks to a licensing agreement with Inngresa…………………. FindBiometrics… FindBiometrics is on its way to Barcelona for Mobile World Congress 2016, and Sensory, Inc. will be exhibiting there. Peter O’Neill, president of FindBiometrics, recently had the opportunity to speak with Todd Mozer, CEO of Sensory in advance of this year’s MWC…………………. Todd Mozer, Embedded Computing – Guest Blog… Everyone familiar with Siri, Google Now, Cortana, S-Voice, and/or Echo is familiar with the progress and improvement in speech recognition over the past decade. Much of this improvement comes from cloud-based recognizers deploying “deep learning” on big data………………..
Todd Mozer, Embedded Computing – Guest Blog… Let me say that I welcome Dong-Jin Koh to lead Samsung Mobile. Samsung has a huge opportunity ahead of itself, and I have some strong opinions on how they should exploit this opportunity with a refined technology strategy………………. Bernard Brafman, AppDeveloper Magazine… Each year faster processors and new APIs offer developers more tools to use in the creation of their apps. While these advances offer opportunities, new capabilities also mean users expect the apps they use to perpetually improve update after update, and user experience is a chart topper on the list of elements they want improved………………..
Donny Jackson, IWCE’s Urgent Communications… Silicon Valley-based Sensory last week announced the availability of TrulySecure 2.0, a multimodal biometric authentication technology that leverages both voice and facial biometrics technologies to ensure secure access to application on mobile Android devices……………..
Gina Jordan, SecureIDNews… Technology licensing company Sensory has launched TrulySecure 2.0, an updated version of its speaker verification and face recognition solution released a year ago. The systems is for mobile, tablets and PCs and enables multimodal biometric authentication……………. Contributed Article, App Developer Magazine… Our mobile phones are a portable treasure trove of personal information. They often carry a record of where we’ve been through the metadata of our photos and the people we talk to in our call and message logs – not to mention our emails, notes, appointments and a range of other things we store inside different apps……………. Colin Johnson, EE Times… Sensory Inc. (Santa Clara, Calif.), the company that brought neural networks—the same type Apple uses to run Siri on “big iron” in the cloud—to the local hand-held devices is now claiming a voice+facial authentication system that uses the cell phone’s mic and camera…………. Peter B. Counter, FindBiometrics… Financial biometrics are spreading like wildfire across the FinTech industry. With all the big financial service providers and most major banks embracing strong authentication for both payments and banking operations, there have never been so many ways to authorize the movement of money… While face and voice recognition each have their own separate applications in finance, the two modalities can combine to create something quite powerful in terms of flexibility and security…………. Alex Perala, Mobile ID World… With TrulySecure 2.0, Sensory Offers ‘Virtually Impenetrable Security’Sensory Inc. has launched TrulySecure 2.0, the next generation of one of its flagship multimodal platforms…………. Alex Perala, FindBiometrics.com… With TrulySecure 2.0, Sensory Offers ‘Virtually Impenetrable Security’Sensory Inc. has launched TrulySecure 2.0, the next generation of one of its flagship multimodal platforms………..
Peter B. Counter, FindBiometrics.com… TrulySecure 2.0 was released this morning and I recently had a chance to speak with Sensory’s CEO, Todd Mozer, about what’s new with this latest update………. Bryon Moyer, EEJournal… If you read our earlier piece on QuickLogic’s EOS device, and if you were paying attention to details, you might recall a quick mention of a company called Sensory that had partnered with QuickLogic for audio algorithms. Sensory subsequently released a product called TrulyHandsFree, and I connected with them to find out more about who they are and what they do……..
NPN via Raycom News Network, WBRC… Passwords are passe... Insiders say the future of security, especially in banking, will be using biometrics to log in to accounts……. Jodi Mohrmann, News4JAX… Between voice activation, facial recognition and fingerprint verification, experts say biometric banking is booming….Biometrics expert Todd Mozer with Sensory Inc. explains what biometrics means. …….. Planet Biometrics… Newly certified FIDO 1.0 products include FIDO authenticators and servers from Egis, Feitian, GoTrust, MicroStrategy, Sensory, SK Planet, and Synaptics. ……..
Sensory is no newcomer to our Star Performer awards. The company received this honor last year for the introduction of its TrulySecure speaker verification technology, and for further developing its TrulyHandsfree Voice Control technology, which awakens consumer electronic devices once their name is called and enables them to respond without a button pressed. ……..
Alex Perala, FindBiometrics… Sensory, Inc. has launched a new version of its TrulyHandsfree speech recognition system. In addition to a number of other improvements, TrulyHandsfree 4.0 boasts of deep learning technology that allows it to be as much as 80 percent more accurate than the previous iteration of the system. ……..
News Desk, IHS Electronics360… Sensory’s TrulyHandsfree™ embedded always on and always-listening speech recognition platform has received a major upgrade boost in accuracy. By adding advanced deep learning and filter-bank features, Sensory increased accuracy by up to 80%, even in noisy environments. ……..
Leonard Klie, SpeechTech Magazine… New speech extraction techniques in TrulyHandsfree 4.0 allow spoken commands to cut through real-world noise. ……..
Ken Briodagh, IoT Evolution… Bringing machine listening into the IoT through deep learning is a new approach, but one that must be taken seriously. We’ll be watching. ……..
Justin Lee, Biometric Update… TrulyHandsfree 4.0 offers several improvements over the previous version, including larger deep learning acoustic models with higher accuracy, new algorithms that overcome reverb and harsh acoustic environments, advanced filterbank features that improve front-end speech feature extraction, full compatibility with TrulyNatural, and improved architectural scalability which allows for low-power DSP implementations with secondary accuracy improvements at the operating system level. ……..
Daniela Hernandez, Fusion… Take Sensory, for example, a company that develops security and voice-control technology. On Thursday, it released a new version of TrulyHandsfree, an always-on voice-recognition listening system, that benefits from this technology. While much of the AI we interact with on a daily basis–like GoogleNow, Apple’s Siri or Microsoft’s Cortana–is beamed to our devices via the internet, TrulyHandsFree is local. ……..
Staff, Connected World… Biometrics solutions can provide enhanced security for the connected devices that make up the IoT (Internet of Things). Sensory, a biometrics solutions provider, wants to make it even easier for OEMs (original-equipment manufacturers) to embed speaker-verification technology into mobile devices, apps, consumer electronics, and automotive solutions. ……..
Tom Kevan, IHS Electronics 360… Powerful forces, old and new, have come together to dramatically change the way humans interact with devices… “As we have gotten more sophisticated GPUs, we have also gotten more sophisticated ways of interacting with products through voice,” says Todd Mozer, CEO of Sensory Inc. ……..
Justin Lee, Biometric Update … Using advanced noise-robust signal processing, the technology is able to deliver strong performance and accuracy in a wide range of environments, including outdoors and in moderate-noise. ……..
Alex Perala, Mobile ID World… The technology supports multiple user profiles and is able to distinguish between each associated voice; and the more it’s used, the more accurate it gets. Sensory says that it has a success rate of up to 96 percent in accurately identifying users, and a 99.99 percent success rate at identifying impostors. ……..
Luke Patrick, Android Apps Review … VoiceDial works incredibly well and rectifies a lot of its competitors mistakes, offering a way to hands-free dial your contacts with effortless, accurate ease… It’s a superior option to surpass what Siri and OK Google are doing with voice dialing. ……..
Richard Quinnell, EDN Network … With the advent of Apple’s Siri, voice control of electronic devices has entered the mainstream consciousness. This, in turn, has stirred interest in adding voice control to embedded systems, as well………..
Ted Kritsonis, Digital Trends … Sensory Inc. … has released its free VoiceDial app for Android smartphones and tablets, enabling users to make calls to contacts by voice without touching their device………. planet biometrics … Santa Clara-based IT security firm Sensory has released a video showing how its facial and voice recognition biometric app works ……..
FindBiometrics … Designed to be natural, fast, scalable, flexible and accurate, TrulyNatural, according to a press release issued by Sensory, “offers substantive advantages over cloud-based solutions”……..
Leonard Klie, SpeechTechMag … “Over the years, Sensory has pioneered many speech technology trends, most recently with our always-on, always-listening speech solution TrulyHandsfree, a technology that many in the industry thought was impossible to achieve because of the difficult requirements of both high accuracy and low power consumption. We are confident that we have another groundbreaker on our hands with TrulyNatural,” said Todd Mozer, CEO of Sensory, during a press conference……..
Justin Lee, BiometricUpdate.com …Sensory Inc. announced it has released TrulyNatural, a client-based large vocabulary speech recognition platform that offers high accuracy, along with a more consistent and secure user experience……..
Peter Counter, MobileIDWorld… Sensory, Inc. announced today the release of TrulyNatural, a client-based large vocabulary speech recognition platform. Designed to be natural, fast, scalable, flexible and accurate, TrulyNatural, according to a press release issued by Sensory, “offers substantive advantages over cloud-based solutions”……..
Sarah Hanlon, Android Apps Review …Whether you share your Android device or you’re looking for a way to keep certain apps safe from prying eyes, AppLock Face/Voice Recognition is a must-have tool for protecting apps……. Ted Kritsonis, Digital Trends… Comedian Yakov Smirnoff used to notoriously joke that “in Soviet Union, television watches you!”…..
Alex Perala, Mobile ID World … The emerging vulnerabilities of mCommerce are a serious threat, but there are viable multi-factor solutions, and sticking with archaic password systems is not a good option…..
Alex Perala, Mobile ID World … Sensory Inc. has announced a major new partnership with respect to its low-power voice control system. Mobile technology developer Qualcomm has agreed to implement Sensory’s TrulyHandsfree Voice Control 3.0 technology into its upcoming platforms…..
Michele Masterson, Speech Technology Magazine … The new year has barely begun and Sensory has already disclosed a series of partnerships and product rollouts. The company has been expanding, says founder and CEO Todd Mozer, hiring more employees while it continues to grow its authentication technologies on both the speech and vision sides…..
Stephen Mayhew, BiometricUpdate.com … Sensory, Inc has released AppLock, a new Android application available at the Google Play Store that uses biometric fusion to allow mobile device users to secure their applications…. Mike Feibus, Special for USA TODAY … Sensory, which develops voice and vision biometric technology for consumer products, approached me about its new authentication app called AppLock. AppLock, which is available beginning today on the Android Play Store, leverages the smartphone’s microphone as well as the camera to employ both voice and vision to authenticate users…. Leonard Klie, SpeechTechMag.com… Sensory this week released a low-power sound detector that will allow its TrulyHandsfree Voice Control to operate at ultra-low power. This hardware addition is expected to further drive down power consumption and extend the battery life for always-on, always-listening devices that can accept voice inputs for command and control functions…. EET Asia…Targeting wearables, a low power voice trigger is available on the DA7322 and DA7323 where over a dozen keywords can be supported with over 95 per cent accuracy without false triggering. This capability is demonstrated by the TrulyHandsfree always-on voice activation and recognition software provided by Sensory, which includes trigger to search, user-defined triggers, speaker verification and identification and multiple language support. ….. The Editors of Speech Technology…This year, there were notable advancements in mobile authentication, intelligent assistants, visual IVR, wearable devices, natural language, analytics, and mobile voice search. Thanks to our 15 Star Performers, all of these efforts were propelled to new heights….. The Editors of Speech Technology… The Visionary Validator Todd Mozer, Founder, Sensory…..
Jordan Crook, TechCrunch.com…Smart bulbs are pretty cool… until you realize that physically flipping the switch is sometimes faster than unlocking your phone, opening the right app, and controlling the light through your mobile device…Along with voice control (powered by Sensory technology), the Vocca offers similar controls to other smart lighting systems on the market, including control of your light bulbs from your phone, and the ability to set timers for when you wake up, go to sleep, etc…..
gadgetify.com …There is no need for a WiFi connection to get your VOCCA working. The technology is based on voice recognition technology from Sensory……. William Wong, Electronic Design …Todd Mozer, CEO of Sensory Inc., describes new speech and vision technologies that target consumer products including mobile and automotive platforms…..
Peter Counter, MobileIDWorld …Competition is heating up over the security in your pocket. Today, Sensory announced a new biometric solution optimized for smartphones, tablets and PC platforms: TrulySecure™. A software-based multi-factor product, Sensory’s new technology suit is aimed at bringing accessibility to the consumer logical access control market…. Eliane Fiolet, ubergizmo.com …Sensory has been developing speech recognition software solutions for the past 20 years and I had the opportunity to meet CEO Todd Mozer for a demo of TrulySecure™, its new technology that enables biometric authentication for Smartphones, tablets and PCs. Sensory TrulySecure combines voice and face recognition to unlock applications on mobile devices, and it can be used by OEMs to unlock the device itself…. 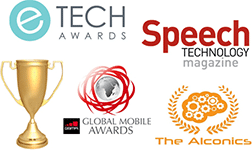 PRNewswire, BARCELONA, Spain…The GSMA today announced the winners of the 19th Annual Global Mobile awards, held at the GSMA Mobile World Congress in Barcelona. The winners were honoured in an afternoon ceremony hosted by British actor, writer, presenter and comedian James Corden. …..
SpeechTechMag.com, The addition of Sensory’s TrulyHandsFree means that Cadence’s DSP voice processors consume less power. …..
Leonard Klie, Speechtechmag.com…Intel has been quietly working on a voice-enabled smart headset personal assistant, code-named Jarvis… In addition to Intel-developed firmware and software, the Intel smart headset reference design uses Sensory’s low-power, always-listening voice recognition technology …..
What’s All This About “Wearables”? PRWeb, Some analysts suggest wearables are the “next big thing” and others suggest a limited role for such devices. A keynote panel at the Mobile Voice Conference, March 3-5 in San Francisco, led by Todd Mozer, CEO, Sensory Inc., will address the issues surrounding the category. …. Ina Fried, recode.net… A big part of Intel’s pitch at CES was that its signature x86 processors could scale from their home turf of PCs all the way down to the smallest of devices… In the case of the (voice assistant-equipped) earpiece, Intel says that it developed the voice-controlled assistant and did note in a fact sheet that the speech recognition technology was powered by Sensory Inc.
Adam Vrankulj, biometricupdate.com…. speech recognition and voice biometric technology have come a long way, and products using voice as a biometric modality are gaining a ton of traction in the market – with particular success in the consumer device and customer authentication spaces… According to Bernie Brafman, VP of Business Development for Sensory, there is one major problem and it’s voice biometric technology’s known Kryptonite: Background noise… Sensory, which focuses on embedded solutions and has been working with speech recognition and speaker identification for 20 years, has integrated speech technology in a new QNX concept car, though speaker recognition isn’t an option. The system lets users plot a route, pick music or perform pre-programmed actions…. “If it has speech recognition, why do we have to use our fingers?” According to Bernie Brafman, Vice President of Business Development at Sensory, that simple question has been at the forefront of many of the company’s customers’ minds throughout Sensory’s 19-year existence… Always-active speech recognition requires that the microphone, ADC, memory and DSP (or other processor running the speech recognition algorithms) be perpetually powered up, presumably leading to unacceptable battery drain in the portable electronics devices that constitute a dominant percentage of Sensory’s various potential markets… By preceding speech recognition with simpler voice detection, along with optimizing the software and the processing core(s) that run them, Sensory believes that it has resolved this quandary…. findBIOMETRICS…Sensory, Inc. today announces the release of TrulyHandsfree™ Voice Control 3.0 with the ability for end users to create their own custom voice triggers and biometric passphrases that identify who they are and unlock features, permit access, or call up customized settings…. Clive Maxfield, All Programmable Planet… By some strange quirk of fate, I’ve been hearing a lot about the topic of embedded speech recently, ranging from discussions on the NPR (National Public Radio) … to articles like Ubiquitous sensors meet the most natural interface – speech on EDN (Electronic Design News)…I’ve been talking to the folks at Sensory. These are the guys and gals who are featured in the EDN article mentioned above; they are also the ones who are giving the paper at Design West. In addition to having their own custom microcontroller that is dedicated to embedded speech applications, they also have an SDK (software development kit) and API (application programming interface) that allows their speech recognition and generation software to be run on other processors…. Tensilica , …Tensilica is working with Sensory and other software partners that will provide the voice-activation, speech command recognition, voice pre-processing and noise reduction products optimized on the HiFi Mini DSP…”Power is the single most important factor in enabling always-on listening capability in mobile devices. Using Sensory’s TrulyHandsfree™ voice control technology, HiFi Mini is able to achieve less than 88 uW of power for the core in 28 nm HPL, achieving both the lowest power consumption and uncompromising accuracy for speech recognition,” stated Larry Przywara, Tensilica’s senior director of mobile multimedia …The HiFi Mini DSP IP core will be available in March 2013. Tensilica will demonstrate Sensory’s Truly Handsfree voice trigger and speech command products on HiFi Mini at the Consumer Electronics Show in booth MP25060, January 8-11, 2013 in Las Vegas, NV USA.